*With regards to Katy Perry (though I prefer Karen Gillian‘s version myself). When one of my Guild Wars alliance mates offered up a SW:TOR buddy key a few weeks ago, I took her up on it since I have been curious about how things would play out given more time to explore other storylines in the world. Since I discovered during the SW:TOR beta weekends that I liked the Bounty Hunter playstyle best (but didn’t care for the story), I rolled a Trooper this time, and had a better time of it. Something about the fact that I was a soldier made it easier to accept the game’s conceits (and most quests) and “just go along” with whatever was going on – I have orders, after all – rather than playing a civilian where I always wonder why they don’t just decide to up and leave. This is true of most MMOs I play, by the way – I like my grunt status, thanks. Look at Aric checking me out, there. I liked playing a Trooper enough to get past many of the other niggling things that I already noted rub me the wrong way about Bioware and traditional MMO style games, and the sad fact is that since Mr. Randomessa refused to join me on this experiment, leveling was easier because I never had to wait on or catch up with him either. So it was with regret that I reached level 15 on my Trooper and the game informed me that I would no longer be able to progress, nor would I be able to continue my storyline to the point of getting to ride in the ship I’d just acquired, or travel to another planet. I’d have known that if I’d read all the fine print, of course. Well played, Bioware. I then rolled a Jedi Consular and an Imperial Agent and hated the gameplay, and further ran into the complication of my Consular being sent to the same planet as my Trooper and therefore running into the exact same quests I’d just completed a day earlier. 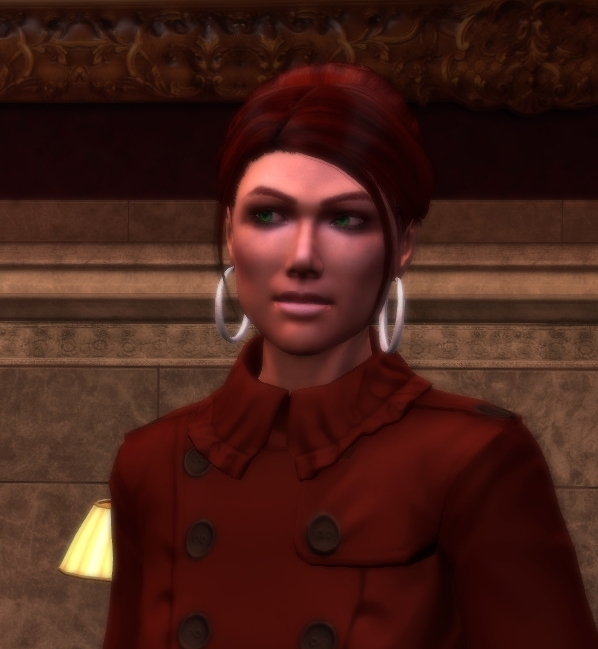 I also had the frustrating experience of my Consular outright stating in her quest dialogue that she would try to find a peaceable solution to the quests my Trooper had previously solved by “lighting it up,” only to be faced with the same sea of red names that my Trooper had. I think I got the option to use Force Persuade at one point, which I guess is the game’s way of letting you have a peaceable solution, but I was kind of hoping I could do things with actual diplomacy rather than Jedi Mind Tricks. I know, I know, I was asking for too much. At any rate, I liked playing the Trooper the most, but I didn’t like it “price of the box at launch cost for 30 days of play” much. If and when there’s a nifty discount on the box price of SW:TOR I’d like to free up her leveling path and see where I can get her, but in the meantime, she’ll remain in the hangar, ineffectually trying to board and re-board her brand new ship. For what it’s worth – which is not much – I would have bought the game at full launch cost in a heartbeat if I could play my Trooper at my leisure, instead of trying to get her as far as possible in a month’s time. But it was not meant to be. This is much more an indictment of the subscription model than Bioware’s game at this point, so I feel I’ve come a long way since that beta weekend so many months ago. In a week’s time I expect to be very very busy, but it would have been nice to at least see if I could put the moves on Aric in the meantime. While I’m sure it will not surprise anyone given my silence on the subject following one hopeful post nearly two years ago, I will not be playing Star Wars: The Old Republic. I have given a lot of thought about what I’d say about the game only if and when I had the opportunity to play it, and I was given that opportunity last weekend. It was probably not the best timing, given what it had to compete with, but it solidified a lot of things for me, culminating in my final decision on the fate of its purchase in our household. Although I did note several similarities to WoW in the gameplay I sampled (rest areas being the most glaring one for me right off the bat), it was the Bioware traits that I ended up having most of my problems with. That’s right, I realized I don’t like Bioware games. I could have come to that conclusion when I never got farther than 10 hours into either Dragon Age: Origins or either KOTOR, but instead I figured I just didn’t like single-player RPGs. With dozens of blissful hours of Skyrim firmly behind me, I can kiss that notion goodbye, so it must be something that Bioware does that doesn’t sit well with me. Considering where I left each of my prior attempts at Bioware games, I think I can safely say that that “thing” mainly is: trapping me. I left DA:O the night I arrived in that town that is being besieged by darkspawn every night – the one you can opt to help or leave to their fate. I quit because prior to making my decision, I tried to leave and return to the town I’d been doing errands in earlier in the day, only to find that it had been destroyed and was no longer accessible. That left me with nowhere else to go. Sure, I could have denied my help to the townspeople, or chosen one of the other two story paths set out for me, but frankly what I wanted was something, almost anything else. I wanted to be able to go places in the world, even at my own peril, and DA:O said I could not. So I quit. So, I thought, finally, maybe KOTOR2 would be more enjoyable? And this one seemed to be breaking the mold! No sewers! And I made it off the starting planet, and the second one, too! But I ultimately accepted my fate on Nar Shadaa, after cozying up to everyone imaginable and destroying a yacht just to get my ship back, only to remember that there was a Jedi to find and train with, and by that time I realized to my dismay that I no longer cared about any of the whole mess at all. Whatever juice Bioware uses to make so many others feel immersed and invested in their games, I must have been dosed with the antidote. It turns out that I simply do not have the patience for staying in one environment that Bioware demands of me. I have never fancied myself a sandbox lover (especially given the MMO interpretation thereof), and I love me some well-crafted and portrayed lore and cutscenes, but at least in most MMOs I’ve played I have a variety of locales I can move through in a relatively brisk manner, or, barring that, a variety of activities I can undertake to advance, even within the same environment. Side quests in Bioware never seemed to satisfy me the way they do in other games with main story threads like Guild Wars or LOTRO. Playing pazzak or swoop racing was not a substitute for tasty alternate story content, in my view. So I tried to keep an open mind when I played SW:TOR last weekend. I wanted to like SW:TOR badly. I was raised on Star Wars (feel free to insert childhood anecdotes that many will have also experienced) – we share a birth year and everything. It’s fate! But in the end, I was a little surprised by how much SW:TOR did not gel with me, though in hindsight the experiences I detailed above make it a no-brainer. I played a Bounty Hunter, a Smuggler, and a Sith Inquisitor, and it wasn’t until the third that I started to feel a bit immersed in the world, since it was the first story where I didn’t feel I was trapped in the environment by a stolen ship or a contest I needed to gain rep to participate in. Also, Seethe is the best power of any character or race in any MMO ever to exist. But by then the beta weekend was ending and I didn’t get to cash in the interest that had just started to build up. I also had a huge problem with the way Bioware morality is assigned. More than once I boggled at the choices that led to Light Side points over Dark Side, and felt like I had to choose between “staying good” and doing what I felt would give my character internal consistency. I saw replies on various forums saying that these choices ultimately did not matter, since you could “grind out” LS/DS points of your choosing doing flashpoints, but since gaming the system is a playstyle I don’t participate in, I didn’t find the notion very comforting. I also had a problem with the options for multiplayer that SW:TOR offers. I’m tired of people scoffing at Warhammer’s open groups or Rift’s public groups as though they are such unoriginal and failed ideas, when they are the only two games I can think of that offer such a seamless way to join with more than 3 or 4 people in the open world (and content that can be easily found and tackled with groups of such large sizes to boot). There are heroic areas with elite mobs in SW:TOR, but they are just as static as the non-heroic areas (or, they were on the level 1-10 planet). I could have grouped, but there was nothing compelling me to. By this I don’t mean that I would only group if forced to by content that would kill me; I mean there was no overarching area threat that could have benefitted from players banding together to deal with it, nor a mechanic to allow that to happen organically. And I get that that’s not what Bioware is going for with SW:TOR, and more’s the pity for it. As for the stories themselves as presented, I thought they were all right, my favorite of the three being the Sith Inquisitor story. In fact, I wish now that I’d started with it, but that brings me to another problem I’ve always had with Bioware’s take on SW:TOR, which is to tie gameplay style with story. I didn’t want to be a mage, I wanted to be a heavily-armored rocket-shooting crowd-controller, but it turns out that that story didn’t interest me as much, so it was off to be a mage I went. I played as a purely Light-Sided Sith, which amused me although my dialogue options tended to be boring. I’d have thought it’d be more interesting to play against type, but it didn’t play that way, so I ended up making up my own interesting quips in my head, and when you’re doing that in a Bioware game, I think you’ve missed the plot. I think that rather sums up my experience playing this and other Bioware games rather succinctly. I’ve missed the plot. I wanted to like it, I’ve heard such excellent things about it, and I’m not terribly opposed to the traditional MMO-ness of it (I am still playing LOTRO, after all). I’m just out of phase or something, stubbornly immune to, or incapable of appreciating, Bioware’s charms. I’m sure that every one of the negatives I listed above have made their way onto someone else’s “must have” list, and so, with something like a kajillion pre-orders, I’m sure Bioware can do just fine without my support. I do, genuinely, wonder if the sales will sustain themselves into ongoing subs six months or a year down the line, and think it will really depend on how quickly and robustly Bioware adds content (no mean feat, with voiceovers to add for everything). 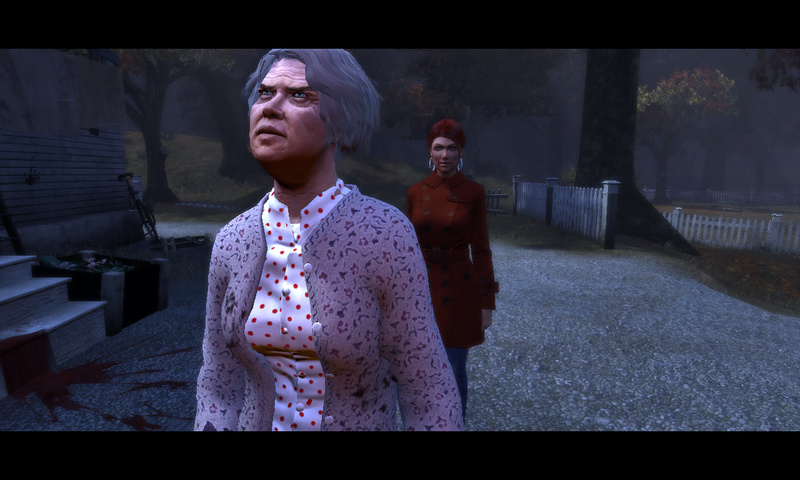 Tying gameplay to story means that I don’t think everyone will play through every storyline just to see how the story goes, there’s bound to be repeated content across factions, and as it stands it’s easy to see the fallout from your various dialogue choices by escaping out, so curiousity won’t drive that bus too far, methinks (and locking people into their dialogue choices without a means to back out would summon a hue and cry that could be heard from Alderaan). I don’t think SW:TOR has anything to fear from other upcoming MMOs coming down the pike, except from people who have already admitted that SW:TOR is only a stopgap on the way to another anticipated game (and I wouldn’t bet there are terribly many of them). The only people who would leave other than that are those who have no particular attachment for the IP or company loyalty, but rather will play anything with “MMO” and “new” written on the tin. People who are playing because “it’s Star Wars” or “it’s Bioware” aren’t going to go anywhere, because, well, it is what’s written on the tin. They are its target audience, and they are well loved. In closing: enjoy, target audience! I’d be pretty excited right now, if I were you. I don’t mean to sound ungrateful. Really, I don’t. The Catacombs dungeon cinematic was a thing of glory, and I reveled in watching 8 minutes of dungeon combat, artfully filmed by ArenaNet and showing off a dazzling array of abilities. But one thing I’d really, really love for ArenaNet to do is a dungeon walkthrough, much akin to the way they first presented the Thief, and introduced underwater combat. Having seen the Alderaan flashpoint video for Star Wars: The Old Republic, and now the menace lurking in the Savage Coast of The Secret World, I think it would go a long way to demonstrating just how this non-trinity kind of combat works, and actually show off the mobility required in a way that the existing dungeon footage does not. A nice developer voiceover explaining what everyone is doing would put a bow around the whole thing. Pretty please, ArenaNet? Just one dungeon walkthrough? It doesn’t even have to be through the spoilery bits! 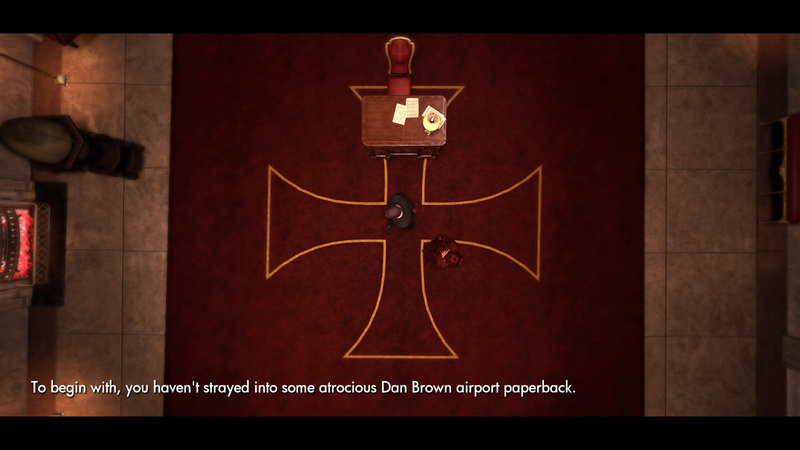 Maybe we’ll get it at Comic-Con, or PAX…. I am having one heck of a time trying to navigate my inner hype-meter regarding BioWare’s Star Wars: The Old Republic and Cryptic’s Star Trek Online. Several months ago my excitement was purely along Trek lines as Cryptic showed off the range of character looks you could create and gave tantalizing glimpses of the final frontier as they envisioned it. In contrast, all I knew about TOR was that it was going to be like the KOTOR games, neither of which had snagged my interest (but then again, see my lack of fondness for single player games). Months later, we have a wealth of further information on each upcoming game, and the more I learn, the more I lean towards TOR and away from STO. I’ve always been more interested in the human side of Star Trek, yet all I’ve seen of the avatars out-of-ship is some combat that looks like it could use some improvement. The space battles Cryptic has shown have been very pretty and impressive, but I don’t want to be a ship, and I don’t want the most interesting things in the game to happen to me while I’m a ship, nor do I want my only options when assuming a bodily presence to be “combat” or “role-playing”. I guess this is where my bias for fantasy games rears its ugly head; I do want to boldly go where no one has gone before, but I’d like to walk around for a while once I get there. I’d probably be the crazy Ensign who “goes native” and decides to stay on an exploration planet, making it my home. On the other hand, the main thing that kept me from playing both KOTOR and Dragon Age: Origins for longer than an hour was that I couldn’t play it with anyone else, so on the surface of it, a game from BioWare that I can play with someone else sounds like precisely something I’d want to try. The first images of the Jedi Consular have me swooning, and companions sound deliciously like Guild Wars’ heroes, just as the mentions of heavy instancing to enable better storytelling reminds me of that game. Why, it’ll be like getting to play Guild Wars 2 in space! My only concern is that I’ve not quite come around on the artistic style of the game; it’s a bit too Clone Wars-y for me sometimes, as I didn’t care for the look of the series or movie, either. My current position is that I’d like to wait until Star Trek Online releases and see what others have to say about it before I make my final decision; however, my better half has watched the latest video on Fleet Actions and declared it necessary to buy the game on launch day. As for The Old Republic… well… my last pre-order was Warhammer and that didn’t turn out as well as I’d have liked, but I think I may have to set aside a fiver to reserve this one for myself. 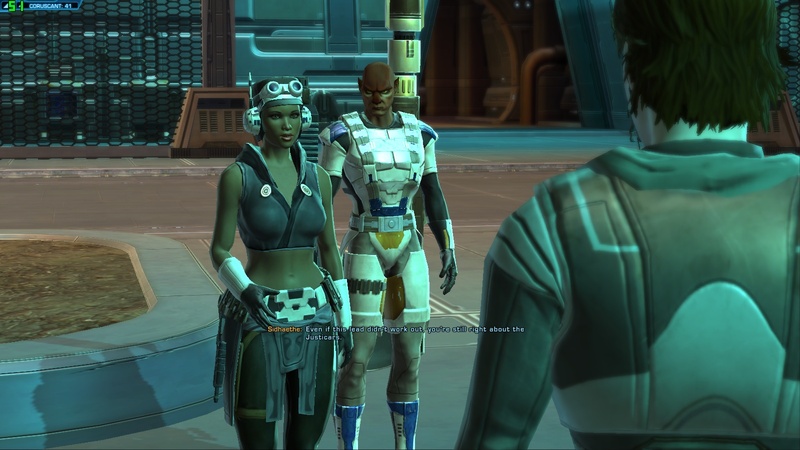 Here’s hoping that a Jedi Consular can party up with an Empire Bounty Hunter, since we’ve each called dibs!